Hollis Taggart Galleries will be presenting the exhibition, Quita Brodhead: Celebrating a Century, to open on Monday, March 5, 2001. Comprised of over forty paintings from private collections and the artist’s personal holdings, the exhibition resulted from our galleries’ ongoing exploration of American modernism. The show was conceived as a way to bring public awareness to a visionary American artist who reveals influences of one of the most important artist-teachers of the twentieth century, namely, Arthur B. Carles. Carles acted as an instructor and mentor early in Quita’s career, and her esteem for his work is certainly reflected in her style. With emphasis on using color as compositional and dynamic elements in the structuring of her paintings, Quita displays her indebtedness to Carles while demonstrating an independent artistic approach. The exhibition, which opens on the artist’s one-hundredth birthday, provides a retrospective view of Quita’s work, highlighting eight decades of painting. Her stylistic development can be seen when comparing early academic studies to later abstracted compositions. 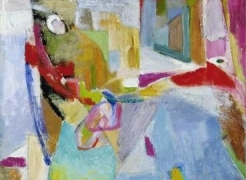 An early work from the 1940s, Woman with White Gloves,--- incorporates Cubist-inspired elements such as her use of passage in the lower right as well as the flattened space of the tilting plane of the table. While these fragmented Cubist motifs are apparent, it is Quita’s concern with texture, brushstroke, and expressive color that has remained constant throughout her career. A still life from 1934, Bouquet with Red Salvia, exemplifies Quita’s vibrant palette and her use of complementary color combinations, such as the bright red flowers which contrast with the electric lime green of the vase. A later work, such as Tenerife, from 1960-61 executed during her ten month stay in the Canary Islands, demonstrates Quita’s shift towards abstraction which incorporates her use of color to create movement and volume. The exhibition in essence constitutes Quita’s biography. In her long life, she has witnessed a multitude of changes in science, in art, in society. It is astounding to hear her recall stories of being taken to school in a horse-drawn bus and her memories of the Wright brothers’ first flight. Similarly, vintage photographs depict her courageous attempts at water-skiing as well as driving her first sports car in the 1920s, which illustrate her zeal for new experiences. The painting from last year, Whence and Where To, epitomizes the way Quita balances the influences of her past with the questions the future holds for her. Because she has always been “contemporary,” her artistic approach and personal outlook have evolved to meet the changes occurring in the world. This idea surfaces in her continued interest in scientific theories; her awareness of new developments in science provides the basis for the forms and titles of many of her later works. Quita’s work contains a variety of subject matter, including portraits, nudes, still lifes, and expressionistic abstraction inspired by landscape. Her later works concentrates on abstraction, either hard-edged and geometric such as Interacting Circles, or flowing and biomorphic like The Endless Circle Series. Even with one hundred years of experience, Quita continues to challenge herself as an artist. The Pennsylvania Academy of the Fine Arts is hosting an exhibition, Quita Brodhead: Paintings 1920-2001, from June 29 to July 22, 2001. Their exhibition is the culmination of a year of recognition for Quita’s work: she had several group and solo exhibitions this past year, as well as receiving the Lifetime Achievement in Art award presented by the Philadelphia Chapter of the Women’s Caucus for Art, at the Woodmere Art Museum, Philadelphia, PA. She is also the 2001 recipient of the Percy M. Owens award for distinguished Pennsylvania artist.Hollis Taggart Galleries will be presenting the exhibition, "Quita Brodhead: Celebrating a Century," to open on Monday, March 5, 2001. Comprised of over forty paintings from private collections and the artist’s personal holdings, the exhibition resulted from our galleries’ ongoing exploration of American modernism. The show was conceived as a way to bring public awareness to a visionary American artist who reveals influences of one of the most important artist-teachers of the twentieth century, namely, Arthur B. Carles. Carles acted as an instructor and mentor early in Quita’s career, and her esteem for his work is certainly reflected in her style. With emphasis on using color as compositional and dynamic elements in the structuring of her paintings, Quita displays her indebtedness to Carles while demonstrating an independent artistic approach.